My days are typically spent, as one might imagine, doing all sorts of mommy things. Stopping toddler from pulling place mats with stuff on them off the table. Stopping toddler from poking the dog in the eye. Stopping toddler from drinking dog water. Stopping toddler from reaching for my morning coffee. Having a dance party with said toddler to the tune of The Most Wonderful Thing About Tiggers. Singing You Are My Sunshine before nap time as toddler sings along with the sweetest sounding “doo” as he snuggles his blankie. Somewhere in there do laundry, cook, clean, photograph, write, and maintain some level of sanity. Despite the overwhelming nature of parenting a tiny human, I adore all of these busy moments because they are fleeting. Riley goes through stages so quickly and I just know...I know...that one day I’ll be wishing I could experience all of these things again. Even the dog water part. Probably. Even though I love these moments, it is the most fantastic feeling to sit down to a simple, adult meal. Sometimes this means sitting down with some of my favorite cookbooks in search of a meal that is easy, satisfying, and out of the ordinary. These tomato scallion shortcakes from Smitten Kitchen fit these requirements perfectly and are now a favorite in our house. Brad, who isn’t actually much of a tomato person, loved them. Riley, lucky boy that he is, got to taste the biscuits fresh out of the oven. They were “ho-T” in his words. Let's just talk about the biscuits for a second: they were SO light and flaky I almost didn't know what to do with myself. As they baked, the tops became a lovely golden brown and they puffed up like a dream. I'm not sure that anything could be better and more comforting than a buttery, warm, flaky biscuit just out of the oven. And these were no exception. The tomatoes are dressed lightly with olive oil, vinegar (the recipe called for red wine vinegar, but I used Champagne vinegar because it's what I had), salt and pepper. Then, they are scooped onto half of a biscuit. Immediately the bread begins to absorb the lovely vinaigrette and tomato juices. Then, the tomatoes are topped with a light, creamy whipped goat cheese before being capped with the top half of the biscuit. Beautiful. We enjoyed our shortcakes on the patio as the sun slowly sank, leaving the air crisp and cool. The sweet, juicy tomatoes with the creamy, tangy goat cheese and flaky biscuits created the perfect balance of textures and flavors. Add white wine and a nice salad and you’ve got a fantastic meal. It was the perfect way for us to end a very busy day/week. I know I'll be making various versions of this recipe throughout the summer- adding basil to the tomatoes, using bunches of chives in the biscuits, or maybe even dill, and perhaps sprinkling a little crispy prosciutto over the top (Brad's current wish). I've been thinking about what a great first course this would be for a spring or summer dinner party, too. It's so easy, wonderfully colorful and elegant. Here's the deal: if you haven't already purchased Deb's cookbook, get on it! It is full of beautiful recipes like this one and will no doubt become a family favorite. Preheat the oven to 425 and line a baking sheet with parchment paper. In a large bowl, whisk together the dry ingredients for your biscuits. Now, take your frozen butter and use a cheese grater to grate it into your dry ingredients. Use your fingers to evenly distribute the butter so the mixtures forms course crumbs. Stir in the sliced scallion(s), then add the milk and stir until the mixture is just evenly wet. Turn the dough onto a lightly floured surface and pat to 3/4 to 1 inch thickness. Use a round cutter, about 3" in diameter, and cut 6-8 biscuits. Place each biscuit on the prepared baking sheet. Bake for about 15 minutes or until the biscuits have turned goden brown on top. While the biscuits are baking, combine the olive oil, vinegar, salt and pepper in a medium bowl. 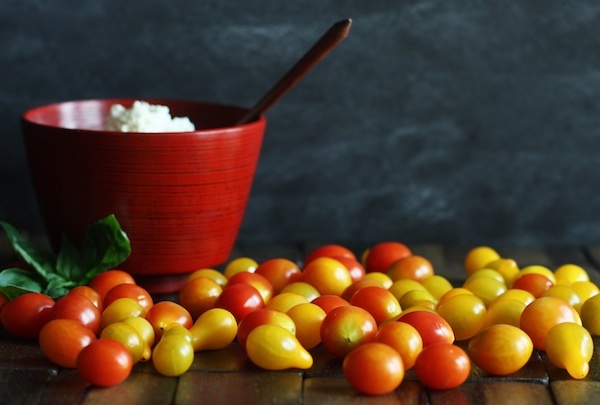 Cut the tomatoes into halves or quarters, depending on their size, and add them to the bowl tossing lightly to coat. Set aside. In another bowl, whip the cream using an electric hand mixer until soft peaks form. Add the softened goat cheese and continue to beat the mixture until it is fluffy. Set aside. When the biscuits are done, allow them to cool on the pan for 2 or 3 minutes until they are still warm but comfortable to handle. Cut each biscuit in half and put on a plate. Top the bottom half with a scoop of the tomatoes, then a dollop of the goat cheese and cover with the top half of the biscuit. Garnish with additional scallions if desired. Serve immediately!